As more and more people continue to be interested in where their food comes from, it’s no surprise that wild foods are gaining in popularity. 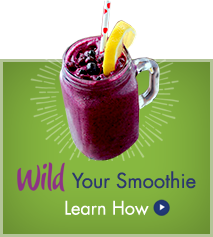 Wild foods, like Wild Blueberries, have never been hybridized or modified by man to alter any of their natural attributes. They are not planted and only grow where mother nature intended. They are nature in its purest and most authentic form. 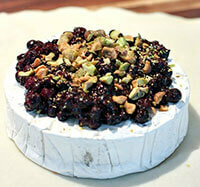 People also gravitate towards wild foods because they believe them to be healthier and taste better. Today we’re celebrating wild foods because Wild Foods Day is around the corner on October 28th! Most wild foods have a rich history because they’ve been around for thousands and thousands of years. Wild Blueberries have been around for over 10,000 years and thrive in the harsh growing conditions of Maine and Eastern Canada. Wild Blueberries naturally protect themselves by producing phytochemicals (like anthocyanin) to combat stressful environmental conditions. 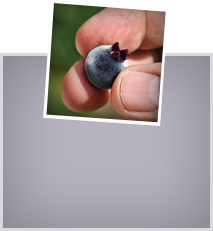 This is one reason why smaller Wild Blueberries have 2x the antioxidants per serving of the larger cultivated blueberries that have been bred to grow on farms all over the world. It’s these potent phytochemicals that give Wild Blueberries their deep-blue color and potential health benefits including gut health, heart health, diabetes, cancer, and brain health. I suppose Native North Americans were on to something believing the Wild Blueberry had magical powers. 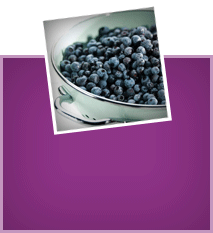 To enjoy the flavor and health benefits of Wild Blueberries requires no foraging. 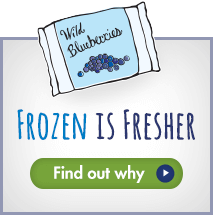 Wild Blueberries are one of the most accessible wild foods to us because they are harvested at their peak of ripeness and frozen to lock in nutrition and flavor. You can find them in the frozen aisle of your local grocery store all year round. 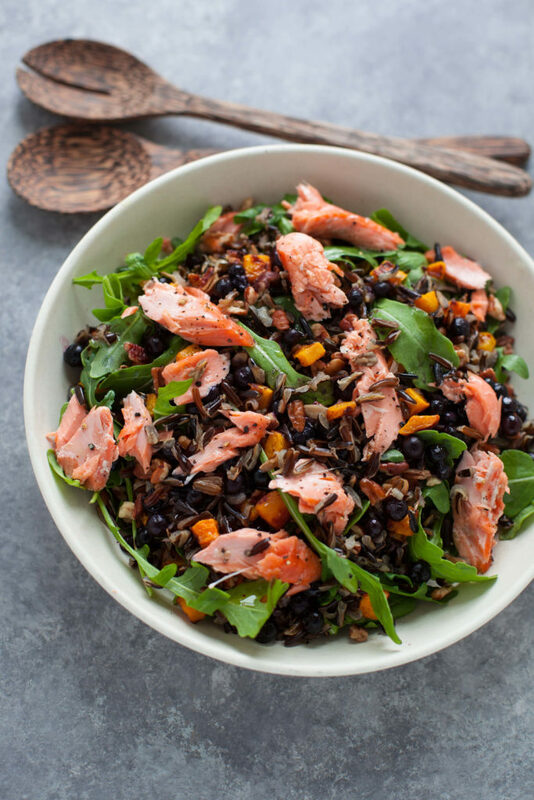 If you’re looking to incorporate more wild foods into your diet to reap some of the health benefits then you’re going to love this recipe, which includes three different wild foods and is perfect for fall. 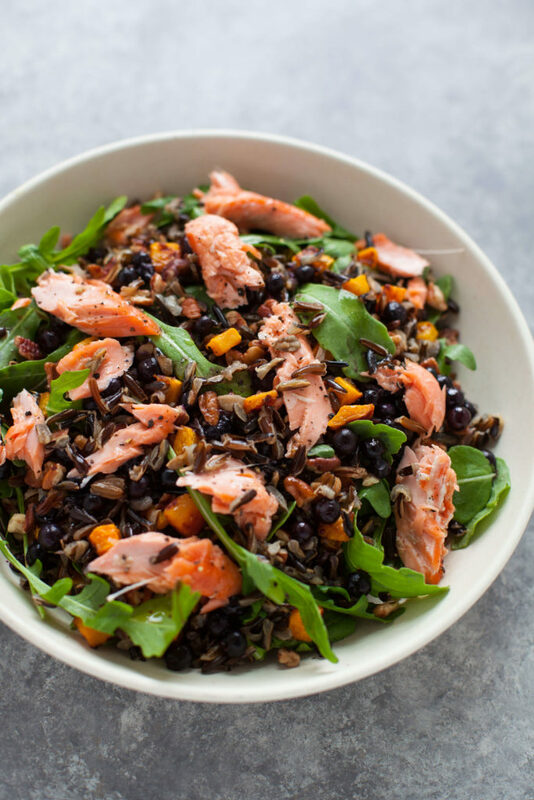 This Wild Foods Salad contains wild rice, flaked wild salmon, Wild Blueberries, arugula, butternut squash, and pecans and is topped off with a maple vinaigrette. It’s hearty thanks to the grains and butternut squash and full of flavor thanks to all the wild foods! 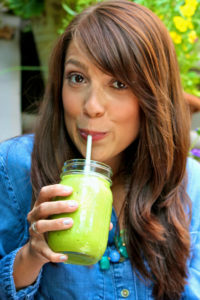 Kara Lydon, RD, LDN, RYT is a nationally recognized food and nutrition expert and yoga teacher based in Boston. Kara offers nutrition & culinary coaching, consults with corporate wellness clients, and partners with like-minded food brands and organizations on recipe development, food photography, and nutrition communications and marketing. Kara has most recently been featured in Fitness, Shape, Today’s Dietitian, Environmental Nutrition, and Food & Nutrition Magazine. 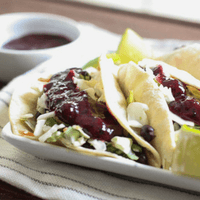 Her food and healthy living blog, The Foodie Dietitian, features delicious seasonal vegetarian recipes and simple strategies to bring more yoga and mindfulness into your life. She has been featured on The Kitchn, BuzzFeed, TODAY, and SELF. Kara previously led health communication strategy for Chobani, Inc., where she pioneered an integrated program targeting health professionals, and served as the key nutrition spokesperson for America’s #1 selling Greek Yogurt brand.